If you can't afford an unlimited plan, you're limited to a certain amount of data each month on your iPhone. 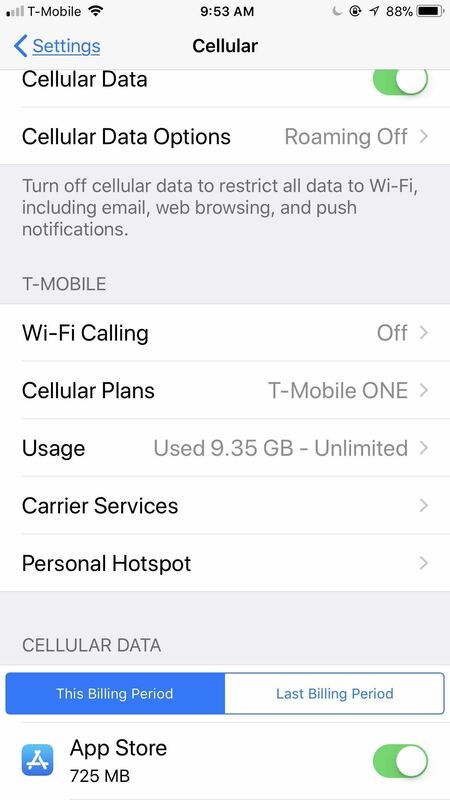 Even some unlimited data plans have carrier-imposed mobile data caps that throttle the user if they exceed them. Keeping track of your exact usage each day will help make sure you don't get billed more or throttled like a chump near the end of the month. Whether you have 1 GB or 10 GB of data to work with or even "unlimited," it's imperative that you know how to monitor your usage effectively so you don't accidentally exceed your limit and either incur unwanted charges or get stuck with slow connectivity and SD videos. There are three main ways to keep tabs on your mobile data on your iPhone; Some users will be able to see the stats right in their Settings app, while everyone else will have to rely on their carrier's app and/or widget. There are also third-party apps such as My Data Manager that could help you out, but we'll just concentrate on the more official methods here. 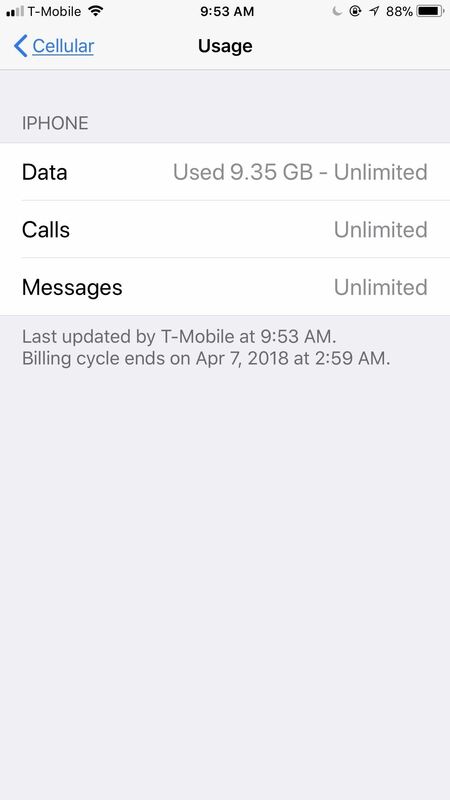 The easiest way to view your cellular data usage is within the Settings app, but this is only really helpful for users who have T-Mobile or some overseas carrier. If you have AT&T, Sprint, or Verizon, you won't be able to see your actual data usage, but you will still be able to work out a method for estimating your monthly data usage, though, it's easier to just use Method 2 or 3 below instead. Go to "Cellular" from inside Settings, and look for your carrier's section. 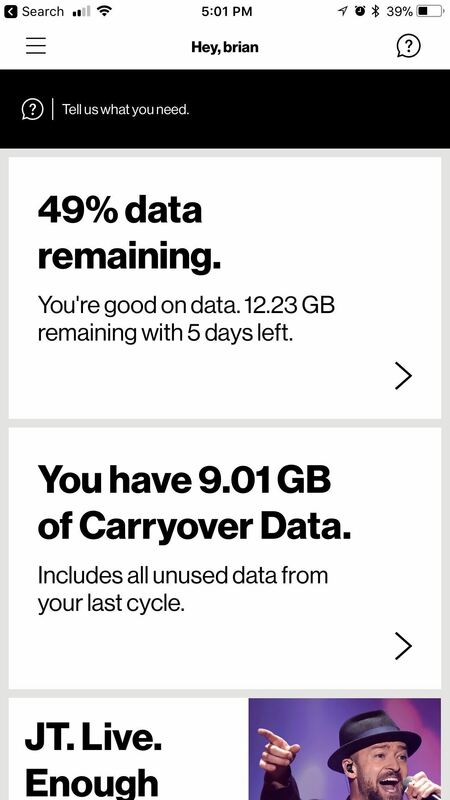 If you see an option called "Usage" under your carrier submenu, tap on that to see how much data you used for the current month out of your limit. It should also give you details about when it was last updated, as well as when your billing cycle ends. In the "Cellular" settings, scroll down a bit to the Cellular Data section. 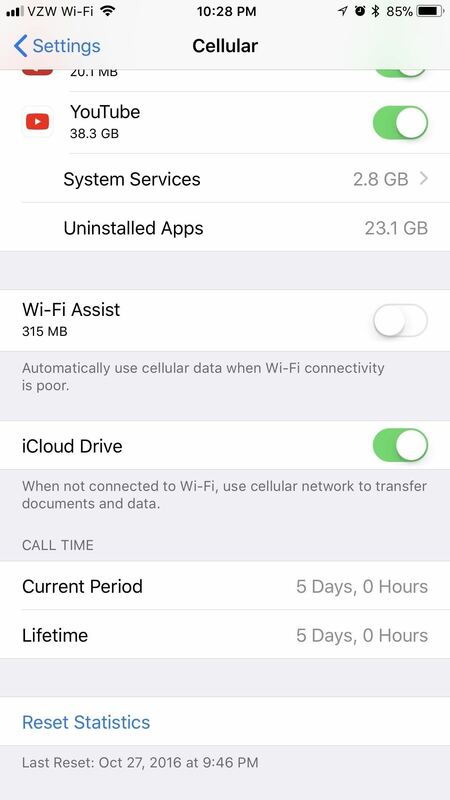 Here, your iPhone will show you how much data you've used in the "Current Period" and on an app-to-app basis. You'll notice that during my current period, I've used 114 GB of data! That's because the usage stats don't reset themselves automatically at the end of the month. You have do this manually yourself at the start of every billing cycle if you even know when that is. 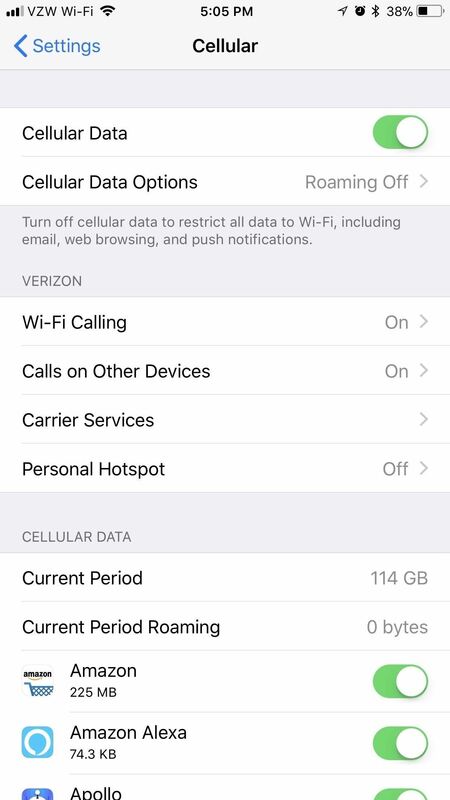 Scroll down to the bottom and hit "Reset Statistics" at the beginning of your data cycle, and your iPhone will track how much mobile data you use. Each carrier has their own app, and it's likely that you already have it installed if you ever paid your bill from your iPhone before. If not, just head to the App Store and find yours by searching for the name of your carrier there. For example, Verizon's app for viewing your personal account information is called "My Verizon." Below is a quick list to the most common carrier apps. 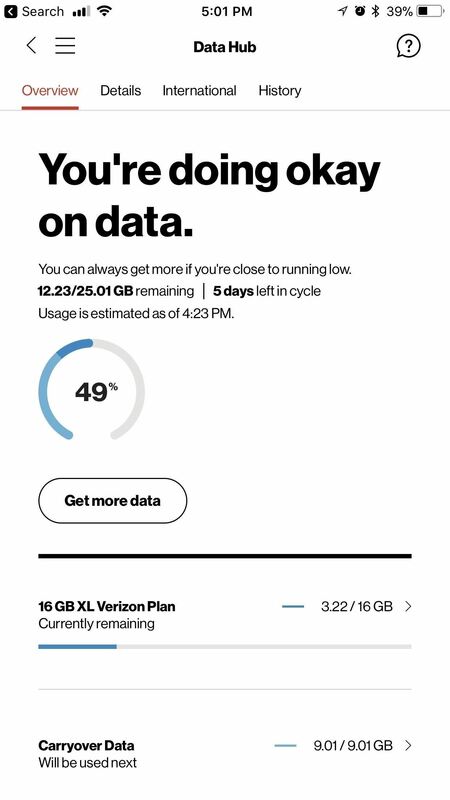 Using My Verizon as an example, once opened and logged in, it will immediately show how much data you or your family used and how much time is left in the month. By going to the "Data Hub" (either by tapping on the data remaining note or from the app's menu), you can see even more detailed information about the mobile data stats for the current month. Other carrier apps work similarly. Some carriers (not all) also have widgets available with their account management apps. Verizon is one of the few who provides one, but you can still check and make sure by following these steps. First, if you have an iPhone that supports 3D Touch, just press firmly on the app's icon on the home screen to bring up the menu. If you see a widget there, you know your carrier has one. If not, they don't. For those of you who do see a widget, it'll show all your stats right there. You can also tap "Add Widget" to add it to your Today View page that can be accessed from anywhere. Alternatively, you can view your Today View page by swiping right from the home screen, from the lock screen, or from the notification center, tap "Edit" at the bottom of it, then look for and add your carrier app's widget (if one exists) to the included side to see your widget everywhere. All three of these methods are effective, though the latter two are necessary for accurate tracking if you don't have T-Mobile. Still, the most important aspect of this is that you're able to easily see how you're doing with regards to data, to avoid overages or throttling. And you could always check out third-party solutions if you're not happy with these methods.